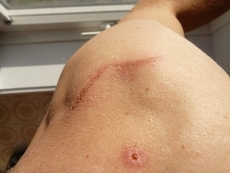 Worker Appeals After Denied Compensation For Rotator Cuff Injury | Pothitakis Law Firm, P.C. Pella Corporation appealed the decision of the district court awarding Charlie Marshall 20 percent industrial disability. The commissioner found that Marshall experienced a rotator cuff tear in his right shoulder in a forklift accident. While working for Pella, Marshall was struck by a forklift and thrown approximately seven feet. Immediately following the incident, he was treated for a cut above his right eye and contusions on his right hand and chest. Marshall was treated by a company doctor who noted that Marshall had a full range of motion in both arms. After a week, the physician cleared him to return to work and perform his normal duties. Two days later, Marshall began to feel pain in his right shoulder. Over the next six months, Marshall received conservative treatment for pain through the company’s physician. He was then referred to an orthopedic surgeon. The surgeon ordered an MRI and subsequently diagnosed a full thickness rotator cuff tear in the right shoulder. Marshall visited his family physician during this time. His family physician expressed the belief that the rotator cuff tear was due to the accident. Physicians at Pella maintained that the rotator cuff tear was not related to the accident. In an initial hearing, the deputy found that Marshall was not able to show that the rotator cuff tear was due to the accident with the forklift. The commissioner reversed the deputy’s decision, giving greater weight to the severity of the injury, the fact that Marshall had not experienced pain or injury to the right shoulder prior to the incident with the forklift, and the opinions of the orthopedic surgeon and Marshall’s family physician. Marshall continued to work at Pella until he took advantage of an early retirement program. Pella argued that Marshall was able to perform his duties at work for a period of time before retirement. Pella also felt that since Marshall is now retired, he should not receive industrial disability benefits as he does not suffer a loss of earning capacity. The court acknowledged and considered these terms, but noted that there are other factors that must be considered in determining industrial disability. Ultimately, the court affirmed the decision of the district court awarding Mr. Marshall 20 percent industrial disability benefits. Had Marshall not appealed the decision of the deputy, he never would have achieved such a strong award in this case. In many cases, it is helpful and appropriate to appeal. As an injured individual, it is your right! If you have been injured on the job, contact the Pothitakis Law Firm online or at 888-459-7613 today. Our experienced Iowa workers’ compensation attorneys will work relentlessly to help you achieve the compensation that you deserve.